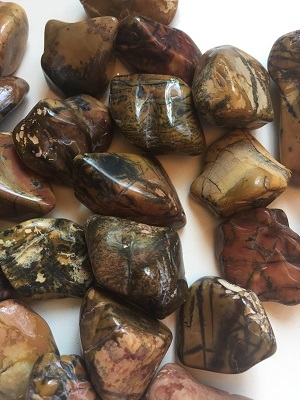 Beautiful mustard and brown colored dramatically patterned feather Jasper Tumbled Stone from Utah, USA. Yellow feather Jasper provides protection during spiritual work and physical travel. Feathers are symbolic of wind, faith, lightness, mobility, air, flight, joy, and contemplation. Yellow feather jasper creates a connection between bird energies and the spirit world. 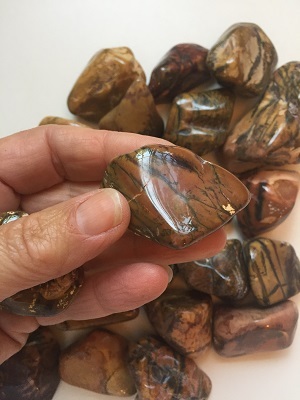 Yellow feather jasper stimulates the solar plexus and creates a channel for positive energy. 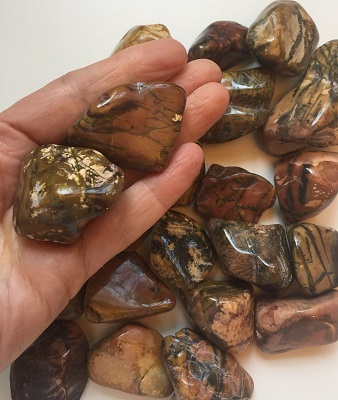 Yellow feather jasper balances yin-yang energies and aligns the physical, emotional, and mental bodies with the etheric realm. Yellow feather jasper assists in lifting prayers upwards to spirit and angels. Yellow feather jasper clears electromagnetic and environmental pollution. 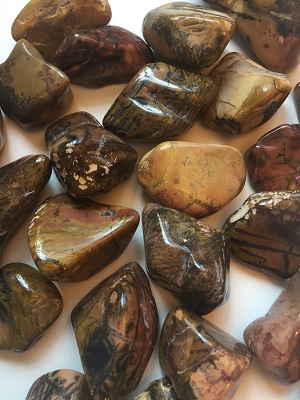 Yellow feather jasper prolongs sexual pleasure, supports one during prolonged illness or hospitalization and re-energizes the body. Yellow feather jasper imparts determination to all pursuits and brings courage to get to grips with problems. In healing, Yellow Jasper facilitates the release of toxins, supports healthy digestion and aids with the healing of stomach issues.